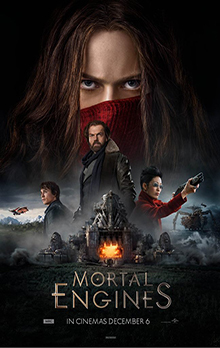 Mortal Engines is a 2018 post-apocalyptic adventure film directed by Christian Rivers and with a screenplay by Fran Walsh, Philippa Boyens and Peter Jackson, based on the novel of the same name by Philip Reeve, and starring Hugo Weaving, Hera Hilmar, Robert Sheehan, Jihae, Ronan Raftery, Leila George, Patrick Malahide, and Stephen Lang. An American-New Zealand co-production, the film is set in a post-apocalyptic steampunk world where entire cities have been mounted on wheels and motorised, and prey on one another. The film had its premiere on November 27, 2018 in London, and is scheduled to be theatrically released in Australia and New Zealand on December 6, 2018 and in the United States on December 14, 2018. Tom (Robert Sheehan) is a sixteen-year-old Londoner who has only ever lived inside his travelling hometown, and his feet have never touched grass, mud or land. His first taste of the outside comes quite abruptly: Tom gets in the way of an attempt by the masked Hester (Hera Hilmar) to kill Thaddeus Valentine (Hugo Weaving), a powerful man she blames for her mother’s murder, and both Hester and Tom end up thrown out of the moving “traction” city, to fend for themselves.